Cover photo from the publication: Goods had to be transported by boat after the Atta Abad landslide flooded 25 km of the Karakoram Highway, Pakistan, in 2010 (credit: D. Butz). Many mountain people are vulnerable and exposed to multiple natural hazards: safe living space is limited and often close to hazard zones; the frequency and magnitude of disasters is increasing, with contributing factors including population growth, urbanization, economic development, ecosystem degradation and climate change; and there is growing competition for safe land, often to the detriment of economically weaker people, who are pushed to the fringes of safe zones. Moreover, hazards occurring in mountains not only threaten the lives and livelihoods of people in remote rural settlements and in the growing urban centres in mountains – they also affect people in the lowlands. The Sendai Framework for Disaster Risk Reduction 2015–2030 offers opportunities to foster safer lives and livelihoods in mountains, if policy and practice consider the specific challenges of mountain regions and communities. The Sendai Framework for Disaster Risk Reduction sets forth four priorities for action (see below). These priorities for action are imperative to reducing disaster risks in the mountains. However, to be fully effective, they must be adapted to the particular challenges faced by mountain people. 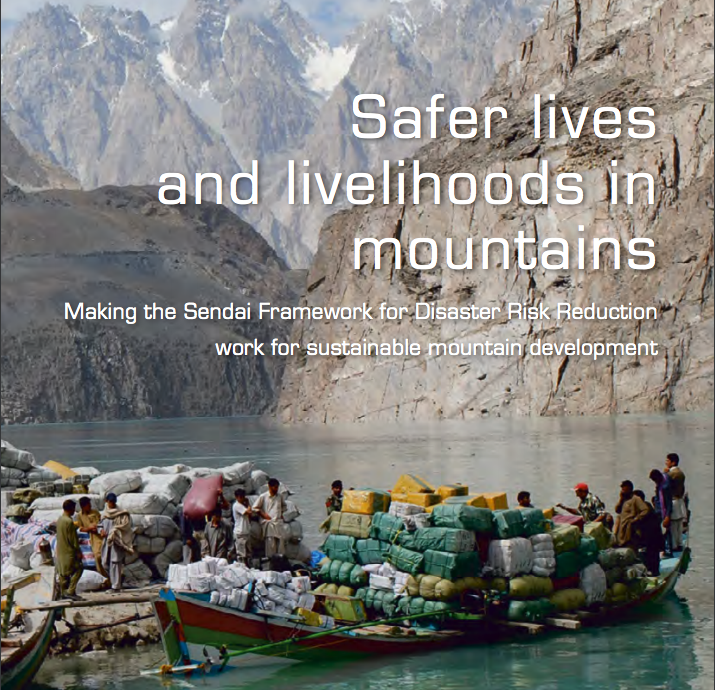 This publication* portrays 15 good practices and applied research for DRR from mountains around the world, to illustrate how the priorities of the Sendai Framework can best be put into practice. These case studies share lessons learned from implementation and highlight the need for integrating DRR measures with development interventions driven by the 2030 Agenda for Sustainable Development and climate change adaptation and mitigation measures. The studies are intended to provide guidance for policy-makers at the local, national and global levels, on how to make living in mountains and their lowlands safer, and secure development gains in the long term. *Download the full publication from the right-hand column. Find details of the contents of the publication and a summary of the points for policy makers below. Recognize mountains as specific, disaster-prone areas in international, national and local policies: To successfully reduce the high disaster risk in mountains, they require special policy attention. This is, firstly, because mountains are multihazard environments where disasters affect mountain communities, critical social and economic infrastructure, the environment and the adjacent lowlands; secondly, because the last decades have seen a noticeable increase in the frequency and magnitude of disasters; and thirdly, because disaster risk reduction (DRR) is particularly challenging where high-magnitude processes are concerned. If global policies, such as the Sendai Framework, and national policies explicitly refer to disaster-related challenges in mountains, this will spur policy- and decision-makers to support mountain-specific implementation strategies. It will also trigger urgently needed investments for effective DRR, for the benefit of mountain and adjacent lowland communities. Bring DRR, climate change adaptation and sustainable mountain development together: Achievements of development efforts in mountains recurrently risk being eroded by disasters and climate change. However, alleviating poverty and enhancing gender equality and the adaptive capacity of women, men and children living in mountains can help to enhance their resilience and reduce their vulnerability to hazards. Moreover, building multifunctional social and economic infrastructure in a risk-informed way is key to improving people’s livelihoods and well-being and reducing future losses – as well as making the most of limited financial and scarce land resources. Uncover underlying mountain-specific risk drivers: In most mountain areas, poverty rates are higher than in lowlands, and economic opportunities more limited. Population growth, urbanization, climate change and effects of globalization tend to increase inequalities in mountains, and they add to competition for the limited safe space and to a spatial concentration of essential infrastructure. This results in greater exposure to hazards of more vulnerable people and of critical infrastructure. Investing in an in-depth understanding of mountain-specific drivers of disaster risk is key to tackling root causes and effectively reducing risk and preventing losses. Invest in fine-scaled, integrative assessments for site-specific DRR: Changing topography, upstream–downstream dynamics, site-specific environmental, economic and institutional conditions, as well as high sociocultural diversity and dynamic global change shape the highly diverse “riskscapes” in mountain watersheds. The complex interactions of these factors make it challenging to assess the risk situation of a specific area and require fine-scaled systematic assessment. In addition, mountains are data-scarce regions, but local people possess pertinent knowledge about nature, hazards and the local socio-economic situation. Only upfront investments in fine-scaled disaster risk assessments that integrate local and scientific knowledge can help to overcome these challenges and allow for planning effective DRR and risk-informed development interventions. Reinforce local DRR institutions to manage risks and disasters, particularly in remote mountain regions and in times of isolation: Mountain communities often live in remote and scattered settlements that are difficult to access and only weakly linked to and supported by national governmental institutions. It is therefore vital that the capacity, leadership and ownership of local DRR organizations are strengthened and their financial resources enhanced, to guide and organize activities across different DRR-relevant sectors, and to take full advantage of the local DRR knowledge. This is especially important in the case of a hazardous event, when immediate response is crucial. Establish inclusive and transboundary multistakeholder platforms to negotiate DRR priorities of mountain and lowland communities: Safe space is limited in mountain areas but there are manifold land use and conservation claims by different stakeholders. Moreover, natural hazards and process dynamics in the upper parts of watersheds can affect downstream communities in and outside mountain areas. Institutionalized processes are needed to negotiate stakeholder interests and priorities, make best use of the limited resources and coordinate activities in a holistic approach across sectors and administrative boundaries. These processes must be inclusive – with special attention given to disadvantaged social groups – and can be scaled up to a transboundary dimension in the watershed, if needed. Foster innovations that expand livelihood options and build mountain people’s resilience: Poverty in mountains is high; livelihood options and public resources are limited. Innovations tailored to mountain-specific challenges serving multiple purposes – e.g. to prevent or mitigate disaster, increase economic opportunities and enhance adaptation to climate change – can go a long way in increasing mountain people’s resilience. Private–public partnerships can help to increase scarce financial resources and trigger innovative solutions, such as multifunctional structural measures or microinsurance schemes for smallholder farmers. Enhance sustainable land management in watersheds to secure key mountain ecosystem services: Population growth as well as climate and socio-economic change are putting ever greater pressure on mountain lands. Risk-conscious urbanization and land use planning in rural areas as well as sustainable land and watershed management are key to moderating extreme events, protecting settlements and infrastructure and safeguarding services of mountain ecosystems. This would also help to adapt to climate change, as well as to ensure food security and livelihood options for mountain communities and the population of adjacent lowlands. Set up decentralized early warning systems based on scientific and traditional knowledge: Prevention is cheaper than recovery and reconstruction. Early warning systems are an effective means when an event occurs. Wherever possible, early warning systems should be set up to be locally manageable. Given the data scarcity in mountains, and to strengthen local ownership, early warning systems should capitalize on traditional knowledge and combine it with information increasingly made available by science and modern technology. Develop the capacity of mountain women and men to act autonomously: In the event of a disaster, prompt and effective response is pivotal to save lives and assets. In areas with traditionally different gender roles and responsibilities, gender-mixed emergency teams are particularly important to respond effectively also to female needs. Far-sighted local capacity building in risk-conscious planning, response and (re)construction facilitates effective and sustainable recovery. It can also provide new income opportunities for trained women and men in mountains, e.g. in construction of earthquake-resistant buildings. Safer livelihoods for people living in mountains and downstream in lowlands can become a reality, provided that policy-makers are committed to promoting and investing in a holistic DRR approach. Such an approach should not only combine measures across the Sendai Framework’s four priorities, but also integrate DRR and climate change adaptation efforts with sustainable development initiatives tailored to the challenges and needs of mountain communities. In this way, the Sendai Framework for Disaster Risk Reduction could contribute to achieving the Sustainable Development Goals in mountain regions and adjacent lowlands and address the United Nations General Assembly’s plea and concerns put forward in its resolution on sustainable mountain development. Wymann von Dach, S., Bachmann, F., Alcántara-Ayala, I., Fuchs, S., Keiler, M., Mishra, A. & Sötz, E., eds. 2017. Safer lives and livelihoods in mountains: Making the Sendai Framework for Disaster Risk Reduction work for sustainable mountain development. Bern, Switzerland, Centre for Development and Environment (CDE), University of Bern, with Bern Open Publishing (BOP). 78 pp. This publication was supported by the Austrian Development Cooperation and the Swiss Agency for Development and Cooperation.